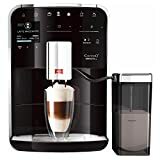 If you want to enjoy the very best barista-style coffee in the comfort of your own home or office, then you need a bean-to-cup coffee machine. Here we’ve ranked the best bean-to-cup coffee machines of 2018 and we’ve also included an easy-to-digest buyers’ guide, so you know which features to look out for. As the name suggests, bean-to-cup coffee machines make coffee directly from the bean. For a piping-hot espresso, all you need to do is pour in the beans, add water and press a button. That’s it. See also: Best Coffee Machine 2018: The 12 BEST Coffee Machines. Click here to read our Sage by Heston Blumenthal BES870UK review. 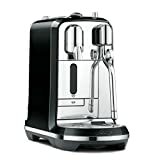 The Jura E6 is a premium, and fully automatic, bean-to-cup coffee machine that will look amazing in any kitchen. The main benefit you’re getting with the Jura E6 is it’s hands-off approach to making your favourite coffee, exactly the way you like it. It can make seven delicious hot drinks at the press of a button. It couldn’t be easier to operate either. The only other thing you’ll need to do is select what type of coffee you want. And doing that is simple too. Everything you need to make a coffee can be found on the machine’s TFT colour screen and steam dial. From the screen, you can set the Jura E6 brewing one of its seven preset coffee recipes. The drinks include espresso, cappuccino, latte macchiato, Americano and can even be used to make tea. For the budding barista, the De’Longhi Magnifica ESAM4200 bean-to-cup coffee machine is a great first step in a coffee career. The domestic appliance has all the features of a café unit including a milk steaming wand, an integrated coffee bean burr grinder and a straightforward control panel to adjust strength and length. 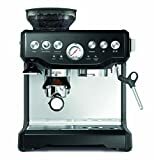 While it might take some trial and error to pour your perfect brew, once found, the De’Longhi Magnifica ESAM4200 serves a fresh espresso using 15 bar pump pressure, at the touch of a button. Its two-cup feature is also a nice addition. While only available for the black coffee options, the machine automatically adjusts the amount of coffee ground in a single brewing cycle ensuring its perfect for two cups. Click here to read our full De’Longhi Magnifica ESAM4200 review. 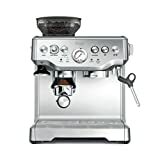 The De-Longhi ESAM2800.SB is not designed as a ‘push a button, walk away’ kind of machine. If that’s what you want, we suggest the Melitta Barista TS F750-201 feature above, or you check out our list of the best capsule coffee machines, instead. 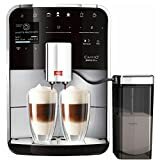 However, with its integrated grinder, milk frother and 1.5-litre removable water tank, the De-Longhi ESAM2800.SB is brilliantly designed for the budding barista. Click here to read our full De’Longhi ESAM2800.SB review. The most obvious feature to look out for here is capacity. It’s fine to keep your coffee beans stored in your machine for a few days, this won’t affect the flavour at all. for this reason, we suggest you go big. You don’t want to be refilling you coffee machine every few days with beans. Part of the reason we like bean-to-cup coffee machines so much is because they put the user in control. You get to choose the beans and the best bean-to-cup coffee will let you decide how coarse you want your beans to be ground. This will have a big impact on the flavour of your coffee, meaning over time, you will be able to work out exactly how you like your coffee ground, and brewed. Manual? Automatic? Or no milk frother at all? 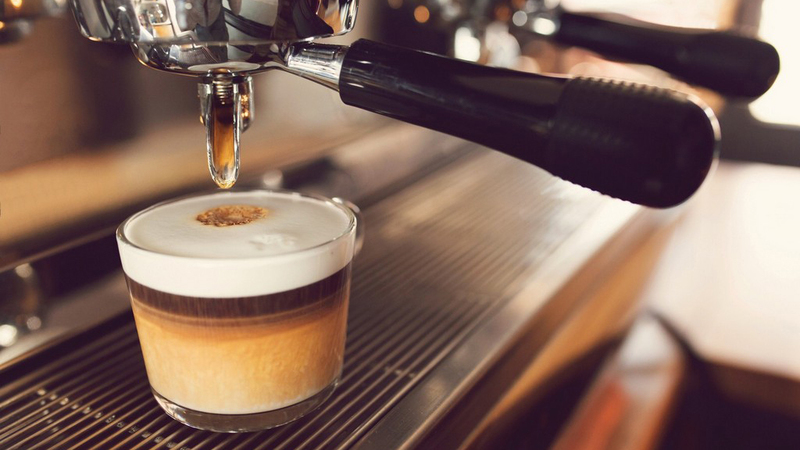 If you’re a latte (cappuccino or flat white) drinker, then you might want to consider a bean-to-cup coffee machine with a built-in milk wand, or better yet, automatical milk frother. The traditional way to make latte-based coffee is with a milk steamer/wand. All this tool does is mix air with tiny drops of boiling hot water (which is steam, effectively). When you insert this wand into a jug of milk it creates the thick froth that sits on top of your espresso. That’s all a latte, cappuccino or flat white is – just with varying degrees of froth. So, if you want to make one of these drinks buy a bean-to-cup coffee machine with a wand and you’ll be making your drinks the professional way. However, that can be laborious. Which is why some bean-to-cup are fully automatic. Just insert your milk, coffee beans, water and press a button. 30-seconds later you’ve got a hot latte. Or flat white. Or cappuccino. There’s no right or wrong decision here. Just think about what you want before you make a purchase. Making it the professional way might sound tempting. But if you’re doing this several times a day, every day, it may soon become a chore. Of course, there is a third option. Buy a bean-to-cup coffee machine with no milk frother at all. Below you’ll find some of our favourite free-standing milk frothers. Cleaning is the one downside to owning a coffee machine. If you own a bean-to-cup coffee machine that’s capable of making lattes and cappuccinos, you need to be extra careful as stale milk is a lot harder (and grubbier) to clean than stale coffee. Thankfully, most bean-to-cup coffee machines have cleaning covered. High-end bean-to-cup coffee machines will have a self-cleaning mode, where it runs hot water through its pipes and flushes itself out. 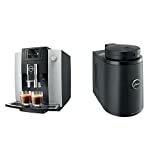 We suggest looking for a machine with this feature if you want a coffee machine that’s going to give you an easy life. 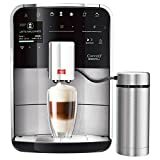 If you do buy/want a coffee machine with that automatically brews a latte-based coffee, then we also suggest looking for one that has dishwasher-safe milk components. Some high-end machines will come with a refrigerated milk container. We consider this to be the best option. Read next: Nespresso Creatista Plus review: A Versatile and well-equipped coffee machine.